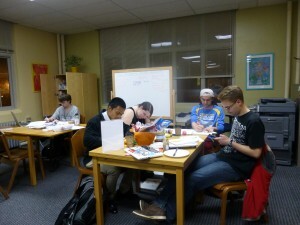 Recap: Long Night Against Procrastination! Last night, the CWLT hosted the Long Night Against Procrastination from 3pm to 1am, and I would say that it was pretty successful! After two full hours of practice for the Hawaii Club’s annual Lu’au, I came to the CWLT with ambitions of finishing a biology assignment, studying for an upcoming exam, and starting essay. 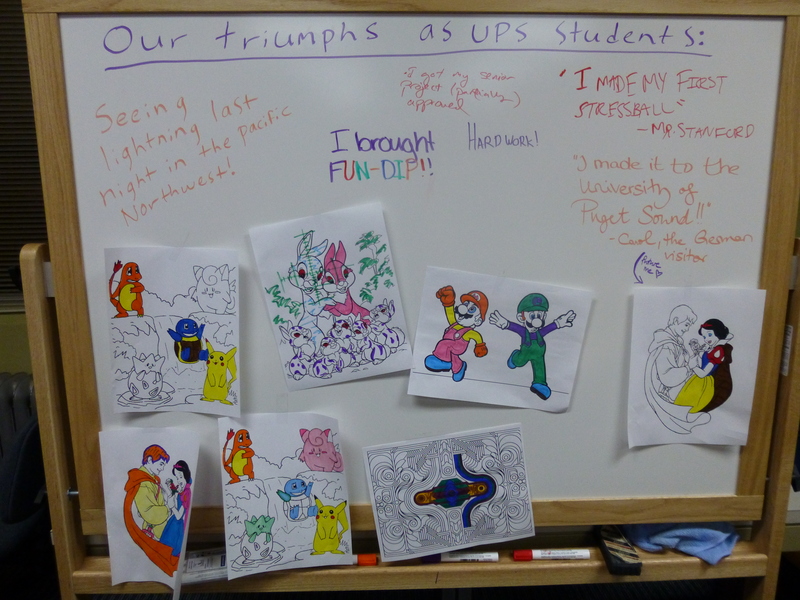 When I walked through the door, I was greeted by a strange, yet somehow endearing balloon head with a newspaper hat and a group of students who were intently coloring Disney characters. A few students were doing econ homework at a table that had been clearly claimed by craft supplies (including uncooked rice and balloons for stress ball making). Long Night was in full swing. 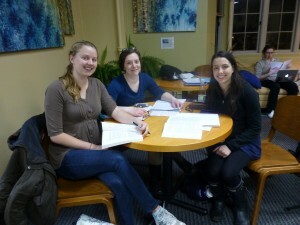 Though I didn’t get quite as much work done as expected, I enjoyed the study breaks and the hearty German pretzels. Maya led us in a guided meditation focusing on home, and just before midnight, we played a great game game of Sardines, in which I ended up crouched behind a recycling bin in the basement of Howarth. (I didn’t even know this floor existed until last night.) After the last people had found the group of us hiding near the elevator shaft, I decided it was time to home. 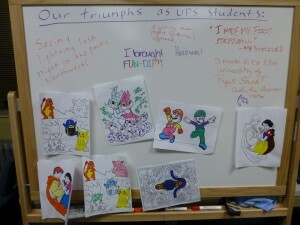 Here are some photos from the night, to give you a sense of the fun that ensued! Garrett hiding (or not hiding?) behind the welcome whiteboard and the balloon head that could be described as unsettling, friendly, or all of the above. The finished works of art! Stressed? 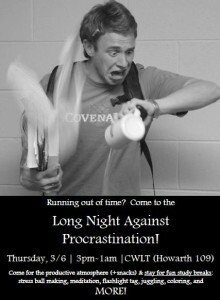 Come to the Long Night Against Procrastination! If you are feeling stressed about everything that has to get done before spring break (like our friend to the right), never fear! On Thursday, March 6 from 3pm to 1am, the CWLT is hosting the annual Long Night of Procrastination! 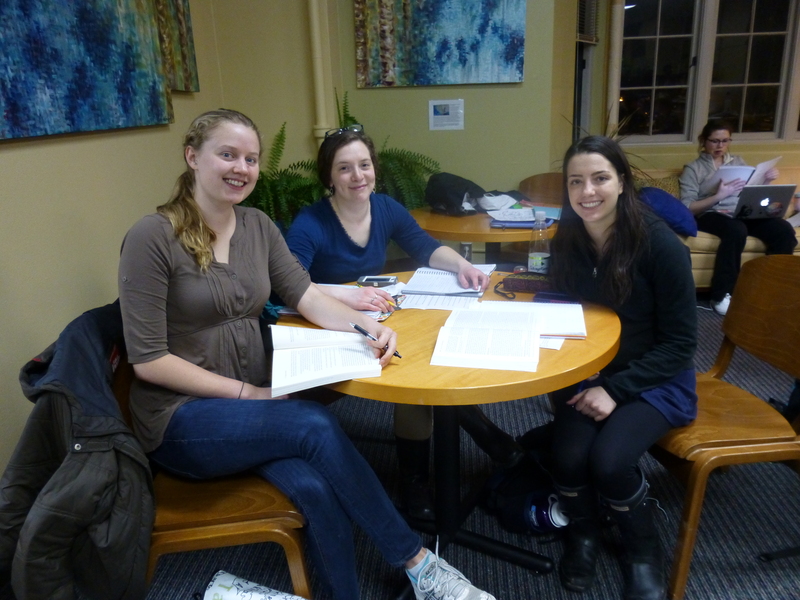 Come to the CWLT’s event for the productive atmosphere, German pastries from Hess Bakery, and the fun study breaks. At the end of each hour, one of the peer tutors or writing advisors will lead a short activity such as learning to juggle, coloring, meditation, flashlight tag, and more. If you’re on Facebook, check out the event we’ve made! Also, while you’re there anyway, like our page as well. 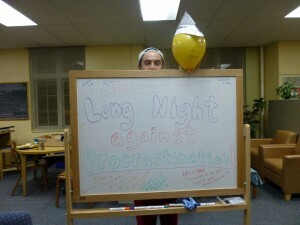 Long Night Against Procrastination (Lange Nachtder aufgeschobenen Hausarbeiten) originated in a German university writing center in 2010 and has since spread across Germany and even to the U.S. It’s meant to an enjoyable night of working hard and having fun at the same time. Interested in publishing as a career? If you’ve ever considered a career in trade, textbook university, or small independent publishing, there will be an interest meeting on campus that’s perfect for you! On Monday, Feb. 10 from 5-6 in WY101, Greta Lindquist (class of 2010) will be talking about her experiences at the Denver Publishing Institute, an intensive 4-week summer program meant to help launch careers in publishing. Greta currently works at the University of California Press, and she is a former CWLT writing advisor! Feel free to drop by even if you have to come late!